What marketers and UX designers are measured against is the effectiveness of their work, which mostly implies an increase in sales. An alternative measure however is consumer satisfaction. So what are the underlying motives that drive satisfaction (and happiness in a broader sense). The British economist Richard Layard suggests that the amount of wealth doesn't matter as much as the amount people have compared to others. In the 1948 a theory was developed, which suggests a hypothesis of relative consumption, implying that happiness is a relative term based on comparison with the situation of others. In other words a person draws satisfaction from his own level of consumption compared to the level of other people's consumption. These influences are relevant especially in regard to material satisfaction as research has highlighted and are therefore of important considerations for advertisers. A perfect example of such a comparison situation would be when an employee gets a pay-rise of 5%. It'll make him/her happy only as long as s/he doesn't know that a colleague in the same position performing equally well got a pay-rise of 10%. This theory of relative consumption has large implications for marketers and UX designers. In particular for exemplifying consumption that is motivated by societal factors, as in the case for luxury goods. 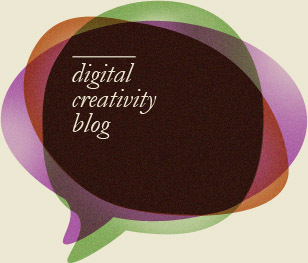 For user-experiences online, this relates to how decisions can be influenced through social media channels. When referred to by peers, information is compared and validated against the original source. The English political economist Nathaniel Foster stated: "The perpetual restless ambition in each of the inferior ranks to raise themselves to the level of those immediately above them" causes fashion and luxury goods to spread like contagion. The tendency is generally to compare upwards, the typical 'keeping up with the Jonses' scenario. With this tendency people are influencing each others' behavior. Levels of consumption therefore depend on the relative level of happiness and not only on the absolute level. The second hypothesis of the relative income theory of consumption assumes that an individual's history and experience have an impact on consumption behavior. James Duesenberry states that "it is harder for a family to reduce its expenditure from a higher level than for a family to refrain from making high expenditures in the first place". The family used to a higher level thinks they 'need' as much as they are used to consume in the past and consequently buy more than the other family who has lower needs. There is a tendency that people are consistent with their perceived needs and pursuit of their goals. This theory has been creatively implemented in a famous advert by Julian Koenig at the agency DDB in 1959. 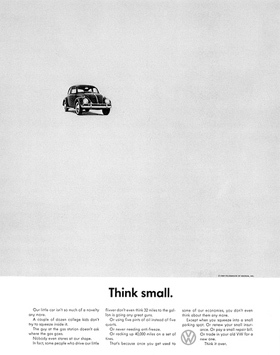 The 'Think Small' campaign gained worldwide recognition at a time when US car manufacturers focused on aspirational values. Instead of communicating the aspects of luxury and space, DDB focused on the benefits of affordability and size. This ad not only comprised a differential advantage, but targeted a consumer segment widely ignored by advertisers in the fifties. Its success is partly due to glorifying smaller cars and generally providing identity to low income consumers, who couldn't afford bigger models.